@Bill KS4MX – Would you happen to have a UV-5R before getting the UV-5X3? If so, are you using the same cable to connect to Chirp? I just received my UV-5X3. I am getting “Radio did not respond” when using Chirp. I noticed the jacks are slightly off to the right. On my UV-5R, the jacks are centered and communicates with Chirp just fine. I think I will return and wait for the next version of the UV-5X3, whenever that may be. “Radio did not Respond” will also appear if you are using the incorrect model selection. If you are trying to Download from Radio with CHIRP, and using Baofeng when the radio is actually a BTech will also cause the message to appear. For the 5X3 you must select BTech. Argh! I had a brain fart. You are absolutely correct. Thank you for the info. I am buying my first amature radio. How does the performance of this radio on 2meter and 70 cm compare to the UV-82HP and the BF-F8HP? Which do you recommend? The basic internal board designs are very similar on each. Although the 82HP and F8HP are both 7-8W, there are several extra features in the 5X3, such as the synchronized display, add/delete scan channels via the keypad, and of course the 1.25m band. My go to radio today is the 5X3 for the 3 reasons above. If we exclude 220 band support, would you choose the 5X3 or the Anytone NSTIG-8R? Looking at one of those two as my first handheld. I really can’t recommend one over the other as the features are so varied. I use my 5X3 more often because of the synchronized display. Here’s a feature list of the NSTIG-8R. I think you’ll find more support for the 5X3, only because of the popularity. I just got mine…. I did find out it will NOT display incoming DTMF tones as advertised…. or so far, I haven’t discovered it, even though the option is enabled. It easily programmed with Chirp. I use the USB chip as suggested as a cheap alternative by Miklor. The functions need described/documented for the Chirp settings. The stock 220 antenna isn’t bad;but I use my 2meter/220 antennas that I used on my other Baofengs. 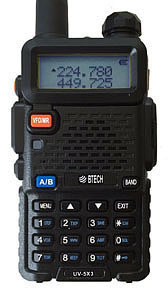 John, to display the CTCSS tone being sent by a repeater, try the following. – Radio must be in VFO mode, not MR (channel) mode. This will start the scanning process. I hope this assists. Didn’t help… question was DTMF tones, NOT CTCSS 🙂 I have noticed, however, random digits going across my screen at times, like it is receiving some weird tones sent by ghosts. Oops, misread your question above. The ANI code will display on the LCD. You can test by sending a simplex signal to the 5X3 and very rapidly send a few random digits, like 444. Yeah. Did that. Just tried again. It works; but you have to key fast. Plus, earlier I may have descended mine. Have you noticed random numbers appear on yours when you have that function enabled? Doesn’t happen all the time. You have to key them in quickly to test, as the actual ANI codes come through approx 5 chars per second. I haven’t noticed any extra characters, but I don’t use ANI here, John, so menu 40 is turned OFF. Forgot to follow up. Yes.. it needed a fast sequence to display them. Works fine. I really don’t need the function; but it does increase the cool factor. Thanks for the guidance. https://www.facebook.com/groups/uv5x3/ My fairly new group. Also just put up a comparison video link comparing the 70 cm harmonics on 220. The 5X3 does well… the UV82X does horrible!